Keeping up with OfSTED’s Goalposts. What SLTs should do. My blog post reporting on a bloggers’ meeting with OfSTED has gone crazy. 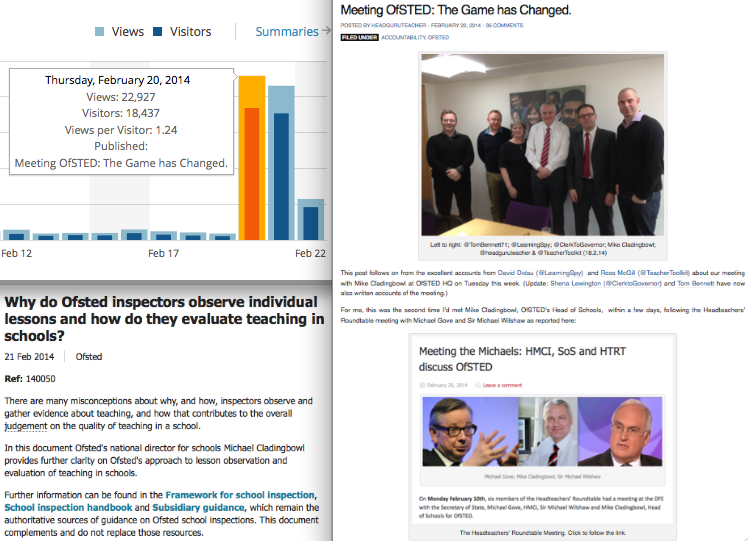 My post on Thursday, Meeting OfSTED: The Game has Changed has blasted all my previous blog stats out of the water, heading for 50,000 views in three days. (Update: Now 80,000) It’s been an astonishing few days of questions and queries about the real meaning of what is going on. Mike Cladingbowl has published a clarification and even that has raised further questions. Having invited a group of us to meet him – on the basis of our blogged views on OfSTED – he even took pains to consult us on the content of the clarification. He wants to get it right; that’s what he said. My interpretation of all of this is that Mike Cladingbowl has found himself in charge of a process that is widely misinterpreted and he is determined to change that. He seems to see the blog-world as an agent of change and a good way to get a message out (and he has made a commitment to consult more widely.) However, he can’t simply re-write the framework overnight; he can only issue guidance pending a more permanent change in the future, following consultation. Nevertheless, it seems pretty clear that the final paragraph of his article is where things are heading: the whole notion of grading is on the way out. However, as David Didau has outlined very clearly in this post: http://www.learningspy.co.uk/featured/ofsteds-evaluation-form-next-skirmish/, there is a fair amount of residual confusion. And until we get rid of all the thematic evidence grades, there will always be confusion. Any graded evidence that emerges from any lesson will be attributed to that teacher, whether people like it or not – even if it is not a judgement of that teacher or the lesson. I sense that Mike Cladingbowl is aware of this and will seek to change things as quickly as he can because, otherwise, this will rumble on and on. Meanwhile, what do we do? Even aside from the nuances of grades being given as general evidence or about a specific lesson, this discussion has underlined some crucial principles that schools should take heed of. 1. It is not meaningful to judge a lesson with a grade and, without any doubt at all, there is no such thing as an OfSTED-defined grade for a lesson. 2. It is not meaningful to evaluate the quality of teaching delivered by a teacher without triangulating lesson observations with other information: the quality of work in books, exam data and so on. Stop grading lessons; at the very least, stop using ‘OfSTED Criteria’ for lesson grades. These practices are simply untenable. Policies that, for example, suggest that ‘at least two out of three lessons observations will be Good or better’ are unacceptable. The meaning of ‘Good’ cannot apply to a single lesson. Surely that is now clear. It simply doesn’t work that way and OfSTED are making this clear. If your school is determined to retain grading, for reasons of inertia or educational dogma, then the grades have got to be defined locally in some detail – but they cannot be assumed to be OfSTED grades because these don’t exist. Challenge this ferociously if ‘OfSTED Grades’ persist. The grade descriptor does NOT define what any single lesson should be like. BUT, these things cannot be evidenced in a single lesson. Only a much more comprehensive process could evaluate a teacher as contributing to an Outstanding judgement overall. 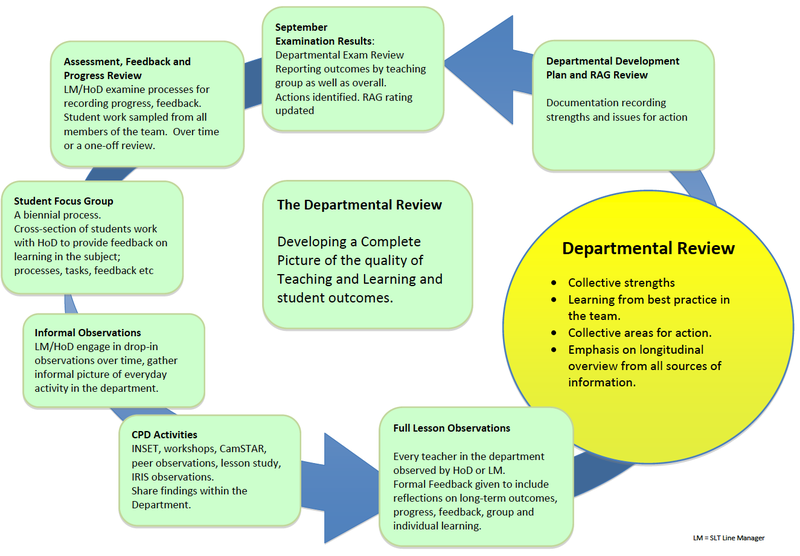 At KEGS, we are in the process of working on our evaluation systems now, working with each department to develop department-specific criteria based on what we think we should be seeing in lessons. Lesson observations will not be graded; we are simply highlighting areas of strength and areas for development, using the language of feedback to convey the level of concern where concerns emerge. It’s taken us too long to get to this point but the OfSTED spectre has held us back; not any more. We still have Outstanding and Good terminology peppered across our documentation; I think we need to revisit all of that and check the meaning of everything we’re saying. A new language is probably required to eliminate the grading psyche of old. Our Departmental Review has triangulation embedded. What about when OfSTED come? If any inspector is still using language like ‘I saw three RI lessons and four Good lessons’ challenge them and report them. They should not be doing this. Similarly, if they tell you that only 65% of lessons were Good or Better and, therefore, the Teaching grade is only Good…challenge them. It’s not how it is supposed to work. In preparing for OfSTED, it is clear that the most important thing is to focus on sustained ingrained practice, not what a lesson should be like during an inspection. Sensible, sustained feedback that leads to student progress as evidenced in books and folders is just as important as is adherence to normal routines for maintaining excellent behaviour. 1. A stronger role for self-evaluation. I would like to see schools producing public self-evaluation reports at the very least every three years if not more often. They should state their strengths and areas for development with reference to the evidence base. OfSTED should use the SEF, of course, but the public nature of a summary report would force everyone to be much more honest and factual. I think every OfSTED report should include a section for a school’s response, published with the report. This would give every school an opportunity to accept or challenge the report’s findings which parents and others could then take a view of. It would make inspectors work more closely with Heads to agree on judgements because neither side would want to see major discrepancies made public. 2. Different types of inspection according to need and context. If schools are doing really well, OfSTED should leave them alone, but visit every so often to test the water in a very light touch way. That could apply to half of schools. The more in-depth inspections should be reserved for schools where there is a clear need to probe deeply to explore areas of low attainment, slow progress or where there are other triggers. In full inspections, the inspection team must include a serving Headteacher from the relevant phase. This may lead to a requirement for all Heads to train as inspectors as part of the job. In my view, this would help to ensure that the system is more robust and more consistent. I can see all of these things happening. Meanwhile, there is plenty that schools can and should be doing to develop intelligent internal processes that do justice to teachers and teaching, far beyond the crude instrument of grading. Update: The TES interviewed me for a podcast on this issue. Mike Cladingbowl is featured as is Jonathan Simons from Policy Exchange. I come in at 22 mins. « Meeting OfSTED: The Game has Changed. Have been really enjoying your blogs (take) on this whole malarkey Tom. 50,000 views – incredible! Thanks Ross. I didn’t really think so much would emerge from that meeting. In fact I didn’t have any expectations at all beyond it being a focus group of some kind. Interesting times for sure. Agree with all of thisTom especially strengthening self evaluation which after all is the key to improvement . Thanks Kevin. Let’s hope this all comes through. This is a monumental shift Tom. All good that the pressure is on Senior Teams to judge accurately and present their case well. I suspect that, to some degree, schools already deemed to have “weak” teaching (whatever that means) will be under great pressure and may be reluctant to move from a grading system. To move up the Main Pay Range, teachers must have made good progress towards their objectives and must demonstrate competence in all elements of the Teachers’ Standards. Teaching over the period of review should be at least ‘good’, in line with Ofsted criteria. Teachers will be observed on at least 3 occasions over the period stated. 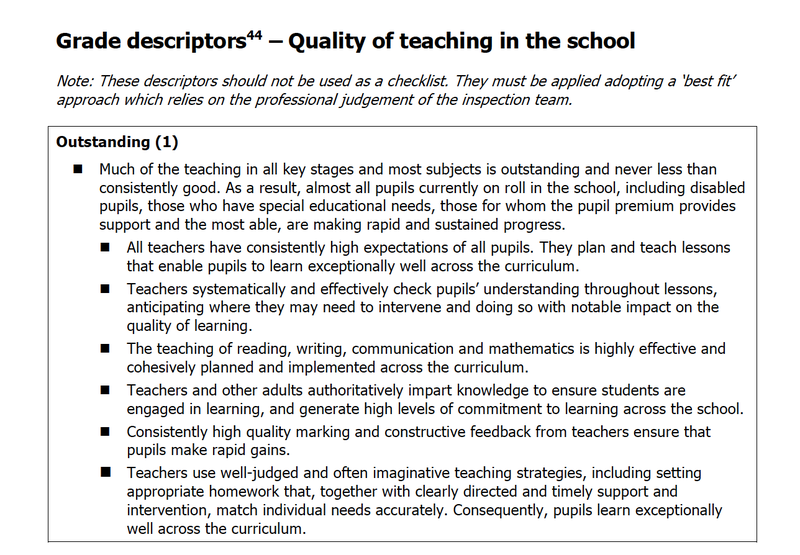 A minimum expectation is that over the period of review teaching is at least “good” (Grade 2 as indicated by OFSTED guidelines). Evidence for this can be taken from these 3 lesson observations, additional lesson observations conducted by members of the senior team or UPS3 Group or by looking at performance outcomes such as GCSE or BTEC results. In the case when observed teaching is less than good, in order to achieve Pay Progression, there should be substantial other evidence indicative of pupil progress for the groups for which the teacher is responsible. Continued effective performance, as defined in i)-iv) below, should give a teacher an expectation of progression to the top of their respective pay range. Let’s hope that Mike C and his team crack on quickly. Thanks for your hard work and determination to drive things forward. I think it’s worth remembering that, unless I’ve missed something, this whole issue with Ofsted (and other) individual lesson observation grades, has been a festering source of stress and disillusion for teachers for some considerable time, but it has all been unlocked by Rob Coe’s ResearchEd 2013 presentation and TDT & Teach First seminar, and associated blogs. Rob Coe’s input has been based on educational research, mainly from the USA, and this work, particularly the MET project, has not just been quantifying the limited reliability of single observations. That outcome is just a small part of the much greater aim of establishing reliable ways to assess teacher effectiveness. So, if we are going to use this research to dismiss a bad system of teacher evaluation, maybe we should be looking at the same research to try to replace it with something better. Suggestions in this blog sound good to me, but what do I know – they may be just as unreliable as what they are replacing. Wouldn’t it be a fine achievement of evidence-based practice if we not only got rid of what research shows does not work, but also replaced it with what research shows does work? While “triangulation” may save teachers from being damned for one poor lesson it may set up situations where teachers are damned whatever they do. If schools – wishing to be seen as aspirational – set targets too high it will be impossible for students to statistically maintain progress in relation to targets, thereby, failing good teachers on a regular basis via Progress Over Time. Schools that are furthest away from National Averages will feel under pressure to be extra aspirational – placing their teachers in even more impossible positions. An excellent blog and lots of food for thought. In Wales we don’t have ofsted of course but their cousin Estyn. Your blog does seem like a clarion call to all SLTs to do the right thing. In our school we do not grade lessons for performance management. We also make every effort to triangulate book reviews and ks4 data with lesson obs as part of our departmental reviews. I’m hoping we are on the right track. As an SLT team we discuss these issues regularly so this and other blogs of this type are brilliant for comparing processes and methodology. Hi John. Sorry, yes, I will look and then discuss. It’s just been a question of time. There’s so much going on! Please resend the link – maybe via email tsherrington@kegs.org.uk I understand the issue of selling products that are also good ideas; unfortunately schools are bombarded with product-sales every day and it is hard to get the attention your idea might deserve amongst all the rest. Thanks for this Tom, I have sent links to the iAbacus http://www.iabacus.co.uk by email. Phew…. just finished first draft on second BLOG for School Improvement Net on “Lesson Grades – considering judgements and moving on” i which I link this BLOG and say nice things about it!